The seven songs of Op 48 are rarely heard as a complete opus on the concert platform. At first glance the sequence appears to be a rag-bag—songs by different poets composed at different times in Brahms’s career, and seemingly put together in a bundle simply to facilitate publication. There may be some truth in this—by the time this opus was issued in 1868 the composer was sufficiently famous for the appearance of his songs in print to be awaited with impatience by singers, and there did not have to be any clever incentive to be built into the planning of the work in order to encourage sales. And yet there are two unifying themes in this collection that are buried beneath the surface and which may, or may not, have been the result of deliberate planning. The first of these is homage to the past, both musical and poetic: the opus opens with a work (Der Gang zum Liebchen) that summons up the pianistic spirit of Chopin and closes with one that pays deep and deliberate tribute to Franz Schubert (Herbstgefühl). There are two numbers (Der Überläufer and Vergangen ist mir Glück und Heil) which delve into the German musical world of the sixteenth century, and two songs taken from that classic collection of folk-poetry Des Knaben Wunderhorn. In later years Brahms would issue volumes of folksong settings of his own. The single Goethe setting Trost in Tränen is written as an impeccable strophic song in the old style, a tribute to yet another old German musical tradition, and this too owes something to Brahms’s veneration of Schubert. The other possible unifying theme is to do with a reading of the texts where everything is to do with fear of betrayal (Nos 1 and 2), suffering as a result of a doomed love affair (Nos 3, 4, and 5), or an overwhelming sense of permanent exclusion and icy isolation (Nos 5, 6 and 7). Whether the composer deliberately planned this collection to capture these moods, or whether he simply responded more readily and more regularly to poetry of this kind, is a moot point. Wie mag es ihr gehn? How is she, I wonder? Me again in her life! Brahms here revisits a poem that he had already set as a ravishing vocal quartet in Vienna in December 1863 (Op 31 No 3); indeed this song began life in Hamburg as a choral item long before this, and resurfaced arranged as a solo song. In a way this is something of a musical re-visit to the emotional realms of Scheiden und Meiden: the same 3/4 time, the carefully adopted folksong style, the emotional insecurity of the narrator reflected in a restless minor-key melody. But there is also great charm here, and the second half of each overall musical strophe (which is to say the second and fourth verses of the poem) are set to music of such delicate, Chopinesque enchantment (including a gradual accelerando sanctioned by the single word animato at the top of bar 14) that one could place this folksong in Poland as easily as in Bohemia. It is, however, much more a waltz than a mazurka, and the piano’s left hand beginning at bar 13 and again at bar 43 indubitably owes more to Vienna than to Warsaw. The buoyant accompaniment helps to give life to a vocal line that has been conceived in stubbornly static crotchets: fortunately the gentle upward sweep of the piano writing lifts the melody out of a potential slough of despond. The words tell of a (perhaps imaginary) rival who intends to seduce the beloved, but the shape of the melody when riding the crest of the accompanimental wave makes something almost coquettish of the song, especially if performed by the female voice. This is also one of those textbook cases in the Brahms Lieder where the tempo is flexible and variable in a way that would be inconceivable for Schubert or Wolf; the wafting meanderings of the voice require a subtle sense of rubato, a coming and going, as if searching here and there for reassurance, lingering as well as hurrying. This laissez-faire is evident enough in the curvaceous teasing of the piano interludes, but is further sanctioned by such phrases as ‘Es ging der Mond unter, / Ich eilte doch munter’ where the hurrying of the lover should occasion a hint of impatience and forward propulsion, followed elsewhere (exactly where is for the singer and pianist to choose) by a corresponding hint of diffidence and insecurity. Brahms is not good at communicating to his performers exactly how these musical subtleties might be managed, but they form an important part of his style. Wie ist mir mein Schatz so treu gewesen! Daß mein Schatz so falsch könnt’ sein. Der meinen Schatz verführen tut. How faithful my sweetheart has been! That my sweetheart could prove so false. Who has seduced my sweetheart. When assembling these Lieder for publication as Op 48, Brahms clearly decided he needed to shuffle songs of certain complexity with others in his portfolio that were more simple. This little song in mournful chorale style dates from a great deal earlier than most of the others, and it fits its purpose in the same way that Francis Poulenc confessed to assembling his cycles: important songs were interspersed by so-called ‘trampoline’ songs, lesser creations designed as linking material; the performers ‘bounced’ off these lesser songs in order to begin the next substantial item in the right spirit. Most of Poulenc’s ‘trampoline’ songs are fast and furious, but Brahms makes the same principle apply to this song, which is planned as an interlude of gravity and repose, and is an introduction to the world of Des Knaben Wunderhorn inhabited by the rather more substantial, but also early, Op 48 No 3. Der Überläufer is a little relic of the Clara Schumann epoch of Brahms’s life where the interplay between the young composer and the older composer’s wife (she was not yet a widow) was full of uncertainty and suppressed romantic possibility. Perhaps Brahms’s choice of text reflects that dilemma and he regarded himself as something of a deserter from that scenario. There is a fourth verse (left out by Brahms) where the narrator hears a trumpeter on parade—the type of poem that might have appealed to Mahler who was a dab hand at songs about the execution of military deserters. So hat mich Liebe verwund’t im tiefsten Grunde. That have run quite dry with weeping. That love has wounded to its inmost depths. If Brahms really had envisaged this opus number being performed as a single work and by a single singer, the presence of this text would strongly argue for a female singer to take over the whole of Op 48—for it is almost impossible to imagine male performance of this text. Once again it is a miniature from an earlier time, but it has a depth of emotional import that can be astonishing in performance. Eric Sams detects Clara Schumann and her plight in this song, and it dates from exactly the time when this was the prevailing emotional issue in the young Brahms’s life. A certain lack of sophistication in the prosody and accentuation of the vocal line (such as the musical hiatus after the word ‘will’ in the first line of the poem) suggests that the gentle contours of this melody were initially conceived instrumentally—for violin and piano for example—with the words superimposed at a later date. For this reason this little offering seems to be a sketch for a song, an eloquent little fragment, rather than a fully developed Lied. If only you could weep! Because of a rich bride’s gold. This is another little fragment of a song, quite different however from the two preceding items from Des Knaben Wunderhorn, apart from the fact that it is once again a plaint with distinctly female overtones. Those two songs had been in distinctly folksong style, and conceived for the mezzo, or even alto voice. Although this poem comes from a collection of folk poetry it has all the airs and graces of a more recent poem, despite the theme of a lover being lured away by money—in this case a rich dowry—being age old. Brahms places the vocal line in the soprano tessitura, and the setting is almost operatic—one can imagine the same Gilda who sings ’Caro nome’ in Verdi’s Rigoletto singing these delicately phrased semiquavers that are elegantly poised on the high-wire of the stave—when the song is performed in the original key at least. The piano writing has notes gently oscillating between the hands in a way that recalls the opening of the famous An die Nachtigall Op 46 No 4. This sets up a kind of neutral background in rhythmic terms that enables the voice to weave and hocket (as in bars 7–8 with the words ‘O, du gold’nes Sternlein mein’), where every syllable is allocated two notes irrespective of linguistic stress—all this in a way that would have been familiar to a composer like Britten. This shows us that as interested in folksong as Brahms was, he was never doctrinaire about his enthusiasms; in opening the door that led to folksong authenticity he had no intention of closing all other doors behind him. Because he took whatever freedoms he deemed necessary, the imagery of starlight and the shedding of sparks of light, pinpricks of radiance, led Brahms into something rather more ornate and bejewelled (in his vocal writing at least, the accompaniment remains simple) than was typical of his treatment of anonymous Slavic texts of this kind. O! komm an unsre Brust! Was mich, den Armen, quält. I’m sure that you’ve been weeping. O come, then, to our breast! Confide to us the loss. What tortures this poor man. You are young in years. To achieve what one desires. It lies too far away. This is a very famous lyric, and one that has more or less defeated every composer who has attempted it. As a result, no setting of what is a fine Goethe poem has ever really entered the repertoire. Only Peter Cornelius (a version for men’s unaccompanied chorus—TTB—with baritone solo) composed a durchkomponiert version with different material for the differing strophes, and this is probably the most successful setting. Loewe’s unaccompanied version for three women’s voices, SSA, also provides novelty of texture. Given the question-and-answer nature of the poem it makes sense that more than one singer should take part—as in the Cornelius and Loewe. But both Schubert and Brahms opted for strictly strophic solo songs with piano accompaniment. These both show enormous deference to Goethe and to the philosophical nature of the text, but unless the listener is a German speaker who is able to treasure each strophe for the sake of what the poet is saying, and how he says it, the sheerly musical effect seems unduly repetitive. There are four alternations between optimistic and depressive temperaments, thus four contrasting passages of major and minor tonalities, and the listener gets the point perfectly well after two strophes. The slowly bouncing gait, an unvarying pattern of crotchet + quaver groupings, runs the risk of becoming irritating. Both Schubert and Brahms use this 6/8 rhythm throughout (Brahms must have known the earlier work published in 1835), but Schubert manages a more sympathetic and more touching colloquy than Brahms, who sounds self-pitying and chromatically lachrymose. Schubert also moves the song along while Brahms elongates it with piano interludes to no clear purpose. But the work is valuable in that it provides us with a self portrait of the composer at the time he was engaged in a relationship with Agathe von Siebold, a woman whom he no doubt considered unattainable in terms of the different social positions into which they had been born. In this setting of a poem of hopeless love we see (as Eric Sams put it) how ‘the idea of separation by circumstances with consequent isolation and frustration, made a powerful and profound appeal to Brahms throughout his creative life’. Listening to this song goes some way to explaining the composer’s lifelong refusal truly to rejoice in his talents and creations, and how he nurtured the chip on his shoulder throughout a life when his friends, even if tempted to pose the major-key questions asked in this song, would have failed to influence his minor-key responses. Heard in this context, the strophic repetitiveness of the song is an indication of the composer’s single-minded determination to use his personal suffering as grist to his musical mill. This is as near to ‘enjoying’ suffering as an artist can get. This is not the greatest of the Brahms songs perhaps, but in this music we encounter the composer in his middle twenties at a moment of self-revealing misery. Mir mag nit besser werden. Ist mir kein Bürd’ zu schwere. Nach fremder Lieb’ nit werben. Ich muß sonst vor Leid verzagen! Tu mir dein Troste geben. Great sorrow shall befall me. No burden is too heavy. And not seek another love. Else I shall despair in sorrow. How shall I surmount it? 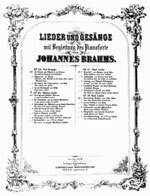 In the previous song we have seen the old German form of the strophic song; here there is something equally German, thus equally appealing to Brahms’s sense of patriotism and history. The words date back at least to 1571 when they appear with music in Ammerbach’s Deutscher Tabalatur, published in Leipzig (Brahms probably found the text in Lieder und Weisen vergangener Jahrhunderte by C F Becker, 1853). In writing modal music of this kind the composer plays the role of the Minnesänger of old, knowledgably aware of the traditions of Teutonic minstrelsy. One can compare this perhaps with the last period of Debussy’s life when the French composer adopted the identity of ‘Claude de France’, a kind of time-travel whereby he could choose to return to a period when the national identity of the past seemed superior to that of the present. In this chorale all the chords are in root position, and an unsympathetic performance may make this music seem as unpalatable as amateur community singing. And yet with the right interpreter and at the right tempo a page like this can sound grand and imposing, ardent and heartfelt. Even when engaged in a kind of pastiche the greatest composers remain essentially who they are—Debussy remained Debussy in his late sonatas, and Brahms remains Brahms in this song. The composer was pleased enough with it to publish it as a four-part choral work in 1874—Op 62 No 7. O Herz, mit deinem ew’gen Schlag! Sieh rings entblättert das Gestäude! Noch mit der letzten, welken Freude? Gib dich zur Ruh’, bald stirbt sie auch. O heart, with your eternal beating! See the shrubs all stripped of leaves! With the withered happiness that remains? Surrender to rest, soon that happiness too will die. Attached to the end of a group of rather slender songs composed in the 1850s, Brahms places one composed in 1867. To say that it is more substantial than the other much earlier works in the opus is a woeful understatement for Herbstgefühl is a masterpiece and was early recognized as such by Clara Schumann. She told Brahms that this song always made her weep—although she was concerned and rather alarmed for his sake to hear that the poem matched his own mood. This period was an exceptionally unhappy one in the composer’s life—including career disappointments in Hamburg and the death of his mother. This lyric is by the immensely cultivated Adolf von Schack, an authority on painting and an expert on, among many other things, the art and literature of Spain (his work on this subject was owned by Brahms). Schack, born in Prussia, eventually settled in Munich at the invitation of the Bavarian king. Some years later the young Münchner Richard Strauss, no doubt dazzled by the poet’s local reputation, chose no fewer than fifteen Schack poems to set to music, the first of which, Ständchen (‘Mach auf! mach auf! doch leise, mein Kind’), is among the most famous of all Lieder. It was Brahms, nevertheless, who was the Schack pioneer, setting three poems to music, all of them remarkable. As Eric Sams put it, ‘even if Schack has no enduring lyric voice of his own, such works give him one’. The poet’s style is elegant and fluent (sometimes too fluent and verging on sentimentality) but two of the finest lieder composers (and Hans Pfitzner and Joseph Marx after them) found the work inspiring enough to set to music. Schack also left a remarkable collection of German Romantic paintings, and the Schack-Galerie (in Munich’s Prinzregentenstrasse) is hardly an insignificant memorial to someone who could easily be written off as a negligible figure in German cultural history. If one can sometimes accuse Brahms of fulsomeness in his songs, this is the antidote—and it is the underplayed nature of the music that counterbalances Schack’s tendency to wallow in somewhat synthetic emotion. There is not one note too many in an accompaniment that begins with 13 bars of bare right-hand chords (the left-hand joins in only in bar 14). The music seems as frozen and bleak as the greyest kind of autumn day. At the end of the first verse the music for ‘im Windhauch schwankt’ will seem eerily familiar to those who listen regularly to Lieder. The second verse is suddenly given over to a passionate forte outburst with an accompaniment in triplets—these too seem familiar. After a denuded interlude where the piano writing seems unusually bare for Brahms, as bare as the trees described in the poem, the third verse signals a return to the frozen music of the opening, again extremely parsimonious by this composer’s normally effulgent standards—as if each chord were played by fingers disabled by frostbite. For the last line of the poem the time-signature changes to 6/4; at the second hearing of that haunting cadential phrase (this time to the words ‘bald stirbt sie auch’) we can identify it as a quotation from the end of Schubert’s song Der Doppelgänger where the same notes are sung to the words ‘in alter Zeit’, accompanied, as in Schubert, by chords also in dotted minims. This famous Heine setting from Schwanengesang was a favourite of the baritone Julius Stockhausen whose accompanist on many an occasion was … Johannes Brahms. Brahms also accompanied Stockhausen in Schubert’s cycle Winterreise, and when we realize this, the inspiration behind Herbstgefühl becomes much clearer—the mention of a season (although autumn as opposed to winter) prompts Schubertian echoes in Brahms who was himself one of the very first among the great composers to acknowledge Schubert not only as an equal, but as a superior. The very spare nature of the accompaniment pays homage to the economy of the earlier composer’s classically inspired style. When he read this poem Brahms must immediately have thought of Letzte Hoffnung in the Schubert cycle, that song where the poet ponders the fate of the last withered leaf on the tree. Those strangely familiar piano triplets in the middle section of Herbstgefühl can be traced back to Erstarrung and Brahms’s memory of having played them for Stockhausen. The very fact that the first and third verses are separated by a stormy middle section also seems profoundly Schubertian in the instrumental sense—one thinks of the slow movement from the String Quintet D956 where the extraordinarily static music of the opening returns after a wind-swept interlude.